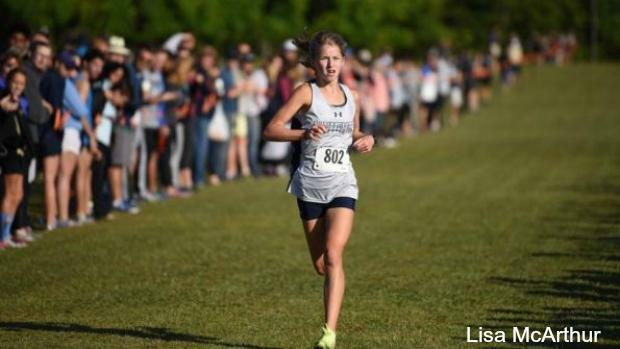 Junior Bethany Graham is without a doubt one of the best XC runners in VA, but she unfortunately will have to wait yet another year for a chance to prove that point. Because of a weird district qualifying rule--which you could make the argument that it is unfair as well--she will not be headed to states this year. Bethany has raced seven times in the past two XC seasons and won six times. She has run times that are comparable to Libby Davidson at her peak and yet has not been able to race at states since her freshman year two seasons ago in 2016. Last year it was an injury that sidelined her in mid-September. That injury was bad enough that her coaches had to shut her down in September and not have her race again until Outdoor Track. She eventually did finish third in the 3200 and seventh in 1600 at states but that was not what she wanted. This year was supposed to be different. Her coaches pulled back on the race schedule and started racing later. She opened with a victory at Pole Green and then followed it up with victories at DCXC and Loudoun County Public School Championships. It was after that race though that things got dicey. She began to have a nagging ankle injury--something that would rectify itself in a week or two. Her coaches did not push her and took it day-by-day. She did try and race with it once at the Third Battle Invitational but had to drop out of the race early on despite leading in a big way. Most would say she would have been in the 17:30 range if she were able to finish. That injury did not get worse after that race, it just needed some rest. It put her and her coaches in a tough spot because just 11 days later was her district meet. This district, the Potomac District, only advanced the top 5 teams and 2 at-large individuals to regionals. In plain terms, she had to either run districts and risk injury or call it quits for the season since her team was definitely not qualifying. This was totally different from Regions 5A and 5B which allowed all runners into the regional meet and had no district qualifying. That is where we think things got pretty unfair. If she had been allowed to rest until today (11/1) she would have had 18 days to rest her ankle and though her coaches wouldn't say definitively, would have definitely given her a shot at being healed up. Unfortunately though she had to race in districts. It was in that race where the ankle really bothered her and definitely did more harm than good. She was still able to finish in 7th place to advance to regionals (5C) after her 19:29 clocking. This week though her coaches had to make the tough call and shut her down for the season. They are going to be focusing her on indoor track now which is a good sign that the injury is not anywhere as serious as last year's. She did not start today's 5C Regional Race.